Opening a worksheet To work on a worksheet that you saved before, choose Open from the File menu.Mathcad prompts you for a name by displaying the Open dialog box. You can locate and open a Mathcad worksheet from other directories or drives just as you would in any other Windows application. At the bottom of the File menu, Mathcad maintains a list of the most recently opened worksheets. You can bypass the Open dialog box by choosing from this list. • Choose Collaboratory from the File menu to open the Collaboratory dialog box. • Select the text that is in the URL text box at the bottom of the dialog box and press [Del] to delete it. Edit a worksheet by opening it by using Open from the File menu and then making any changes you choose. Then, to overwrite the original worksheet with the revised one, choose Save. Mathcad overwrites the original copy of the worksheet with the new copy that is currently shown in the worksheet window. To make changes to an existing worksheet without modifying the original, choose Save As from the File menu instead. You will be prompted for a new name under which to save the worksheet. • Type the name of the template in the “File name” box, or browse to locate it in the dialog box. Worksheet templates are saved by default in the template sub directory. • Scroll to the bottom of your worksheet to update all calculated results. • Choose Save As from the File menu. • In the Save As dialog box, choose “Rich Text Format Files” from the “Save as type” drop-down list. • Enter a file name and then click “Save.” When you open this RTF file with a word processor such as Microsoft Word, you’ll find all the Mathcad regions lined up one above the other at the left edge of the document. 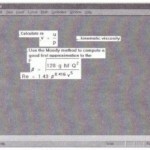 You can then use your word processor to move these regions wherever you want to Once the Mathcad regions saved in an RTF file have been loaded into a word processor, you’ll no longer be able to edit equations and graphs-these will display as embedded graphics in your word processor. You will, however, still be able to edit the text. To embed Mathcad worksheets or regions in a word processing document in a form that allows you to continue to edit the original Mathcad worksheets, see the section “Using OLE” on page 91. • Choose Save or Save As from the File menu. 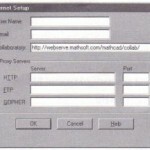 • In the “Save as type” drop-down list, select “Mathcad 6 Files” and provide a file name. • Click “Save” A message will appear warning you that certain features available .only in Mathcad 7 will not work in Mathcad 6. 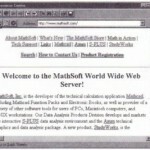 When you open a Mathcad 7 worksheet saved as a Mathcad 6 file in Mathcad 6 for Windows or Macintosh, you may see an additional warning indicating that certain features are not supported. 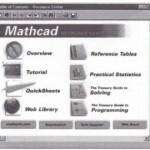 For a list of product features, including features that are new in Mathcad 7, see “Mathcad features” on page 2.